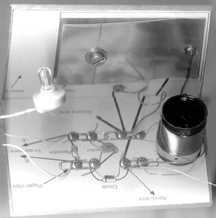 Crystal set radio design - build your own! At age ten I built my first crystal set with great excitement! But, whether you are 10, 100 or somewhere in between, you'll experience great delight in building this little radio from the most basic components. I looked at many designs before deciding on this one. Some had enormous coils of wire and some used expensive parts. This one has neither. It uses the most basic component parts but gives good performance and needs NO batteries and NO SOLDERING. There are various designs which do without an expensive tuning capacitor: everything from paper clips scraping across bare wire coils to ferrite rods used for tuning. I didn't like those designs but I couldn't afford to pay ten pounds JUST for a tuning capacitor! I wanted to sell the complete kit for less than that! The solution, as with many things, was simplicity. A capacitor is, basically, just a couple of metal plates held apart by an insulator. Move those plates and you vary the capacitance. My final design uses the front panel as one plate. The insulating layer is the paper plan itself which you cut out and glue on the foil. The final part is a thin metal plate which is held to the front panel with a single screw. You rely on its own inherent springiness to move the plate away and a simple one-inch bolt to bring it back. The thread in the front panel is actually a "furniture nut". This is the spiked threaded bush that is bashed into a chair leg to hold the castor wheel. Made this way, the design is simple and low-cost. A delight to build. Ideal for boy scouts, girl guides, pensioners and anybody who wants to learn about radio construction, simple electronics or, basically, just have fun!